The U.S. - European relationship remains the closest and most important alliance in the world. Since 1945, successive American presidents each put their own touches on transatlantic relations, but the literature has reached only into the presidency of Lyndon Johnson (1963-1969). This first study of transatlantic relations during the era of Richard Nixon shows a complex, turbulent period during which the postwar period came to an end, and the modern era came to be on both sides of the Atlantic in terms of political, economic, and military relations. 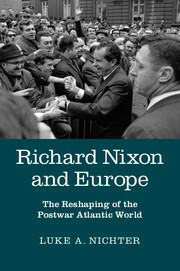 Richard Nixon and Europe: The Reshaping of the Postwar Atlantic Alliance, authored by nixontapes.org editor Luke A. Nichter and published by Cambridge University Press, focuses on key events in the transatlantic relationship during the presidency of Richard Nixon, including: the transformation of NATO, the collapse of the Bretton Woods system, the "Year of Europe," the British decision to renegotiate membership in the European Community, and the American effort to keep Britain in the EC and salvage the Anglo-American "special relationship."